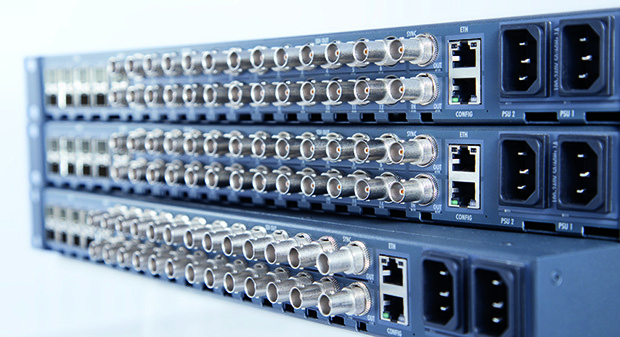 Broadcasters have access to numerous fiber-based signal transport solutions today. From the simplest point-to-point throw-down boxes to more elaborate optical rings, products come in at a variety of performance and price levels. In most cases, the broadcaster that wants a mix of signals will purchase signal-specific modules, slap them into a frame, and go do a show. Audio? That's another module. Data? Another one. A remote monitoring and control system? Probably not included. Signal processing features? Those will require external boxes. By piecing a system together, a broadcaster can get everything needed, but the end result will not perform like an integrated system. It will be impossible to operate with a single management system; it will be difficult to troubleshoot; and, at the end of the day, it will not be cost-effective. A fiber-based signal transport system can represent a significant expense for a broadcaster, and any solution must accommodate both the user's immediate and future needs. Video choices may be analog, HD, 4K, or IP. Audio might be analog, AES, MADI, or even a networked solution such as AVB or Ravenna/AES67. Then there are data, comms, and GPIOs. Considering these possibilities can be daunting, and we're not done! Now factor in routing capabilities. Will point-to-point do the job, or would point-to-multipoint capabilities be really helpful? How about redundancy? How about "glue," such as embedders, signal generators, and quad splits? And finally, can these elements be managed remotely, and will additional gear be available for rental if needed? In reality, few broadcasters have the luxury of addressing all these factors and building a system from the ground up. Rather, they have legacy gear they must continue using and mindsets that must be changed before newer solutions can be considered. Consequently, they're working with systems that comprise many parts, take a lot of time and effort to maintain, and are difficult to use. If broadcasters were equipped with a roadmap of what they need the system to do, then they could start small and build over time to achieve a solution in which different elements work together seamlessly - a solution that is a pleasure to use and capable of growing along with the operation. To simplify signal transport and routing, the world's largest broadcasters use the Riedel MediorNet real-time network, which takes advantage of the massive bandwidth of fiber to do everything on a single cable. The newest addition to the MediorNet family, the MicroN 80G media distribution network device, provides a highly versatile signal interface that can be used in productions of every size and complexity. In just one rack unit, MicroN features eight 10G high-speed SFPs, 24 3G-SDI video, two MADI, Gigabit Ethernet, and integrated routing and sync reference I/Os. Built-in video and audio processing capabilities include automatic format detection, a frame sync and framestore on all video outputs, a 16-channel audio embedder/de-embedder, a test pattern generator, on-screen and system VITC displays, an integrated sample-rate converter, and audio/video delay lines. In large MediorNet networks, MicroN can serve as a breakout box for a Riedel MetroN core router. Operating in standalone mode, the MicroN can act as a 12x12 router and audio embedder/de-embedder with MADI SRC and delay, and also provides video frame sync and delay. Multiple MicroN units can be deployed as part of a larger network or in a stand-alone point-to-point configuration to provide an economical solution for smaller productions. The interconnection of MicroN nodes in a meshed fashion creates a scalable, decentralized video router that can replace small to medium-sized routers and enable flexible system design. Users can extend both signal capacity and distributed system locations by adding MicroN nodes to the network. Truly integrated solutions with built-in routing and processing capabilities are here, and when priced against other complements of equipment, they offer significant cost savings.